Filed UnderMusic Podcast, Thoughts, Etc. There are many vocaloid producing musicians out there these days, all with their own unique sound and voice (mostly). The ones that impress me the most are the ones that utilize two or more of these voice synthesizers to accomplish their goals. My own amazement at this feat is probably due to my ignorance of how these programs actually work, but the thought of juggling music and voice software makes me dizzy just thinking about it. 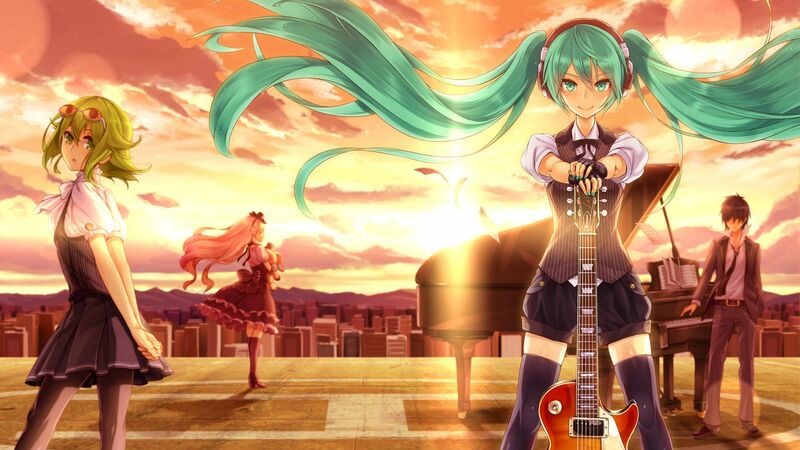 With that here are some of my favorite vocaloid songs the feature two or more of the virtual idols we know and love. This combination of three Vocaloids, and chiptune style music is something I can listen to whether playing games or working. Whenever this song comes up on my phone I find my feet tapping to the beat, and the melody gets stuck in my head. You can find this song and more on the “Planet Dance” album by U-ji! This was the first collaborative vocaloid song I ever heard, as well as the first Project Diva song I ever played. The morose tones were unusual to me in vocaloid music, and the message of love and cheating was refreshing to me. It’s a fantastic song even in it’s misery, and it’s a lot of fun to play. If you haven’t tried a Project Diva game, you should give this one a try. I can’t remember when it was I found this song on Karent, but I remember being exuberant when I found it. This collab is one of the only examples of Vocaloid music clashing with hispanic music. The salsa theme combined with the Japanese lyrics works surprisingly well together, and I really hope there is more of this in the future! You can find this song on the “Margherita!” album by Nanameue-P.
Summer Idol is a song you can see idol groups from AKB 48 to Girl’s Generation singing. A song with girls singing about a summer love while wearing a bathing suit is not something new in the world of J-pop, but the silly nature of this song really makes it stand out to me. I enjoy playing this Project Diva song, and the end of the song always kills me. Unfortunately I do not know where you can legally find this song, but you could always play it on Project Diva f.
I’m not gonna lie this was not originally the song I had pegged for this spot, but while trying to find the other song on YouTube I stumbled on this one and instantly fell in love with it. The lyrical tempo, and the fantastic beat really get my heart pumping and makes me want to dance (if I could without a heavy dose of alcohol). It’s not often that I like songs with Len in them, but this one got my attention.